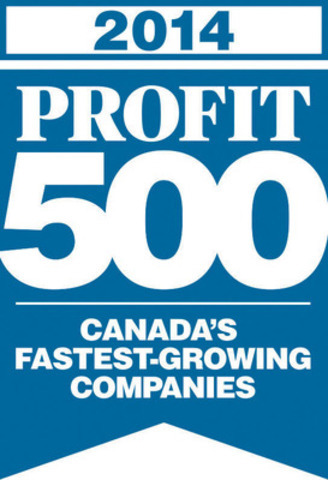 CALGARY, June 12, 2014 /CNW/ - ProStar Cleaning & Restoration Inc. "ProStar" of Calgary was ranked 339th by PROFIT Magazine for their 26th annual PROFIT 500, the definitive ranking of Canada's Fastest-Growing Companies. Ranking Canada's fastest-growing companies by five year revenue growth, the PROFIT 500 profiles the country's most successful growth companies. Published in the summer issue if PROFIT magazine and online at PROFIT500.com, the PROFIT 500 is Canada's largest celebration of entrepreneurial achievement. "We are proud to be recognized amongst this distinguished group of Canadian companies," says Jodi Scarlett President and Haskayne Business School MBA graduate. "This award demonstrates the accomplishments of the team of exceptional individuals at ProStar who work together to lead the Cleaning and Restoration industry and are committed to a Job done right." Canada's Fastest-Growing Companies operate in a huge array of industries and represent emerging leaders in the business community. Started in 2002, ProStar has emerged as a leader in Restoration, Construction and Cleaning. "From emergency services to contents processing, ProStar is proud to be a one-stop-shop for clients," Scarlett adds "As a firm certified by the IICRC, my top management and field personnel undergo extensive training. You can rely on ProStar to take care of your project from start to finish and always uphold the highest industry standards as well as our personal standard Job done right." ProStar Cleaning & Restoration Inc. is a one-stop shop, for everything from emergency services to Reconstruction and Cleaning. Started in 2002, Haskayne Business School MBA graduate, Jodi Scarlett, founded ProStar days after her graduation. ProStar evolved from humble residential maid service beginnings, with an average sale of $180, to a full scale 24/7/365 construction firm completing projects up to $3Million in size. The company now employs over 50 individuals with revenues approaching $10Million annually. Jodi Scarlett has been able to leverage her MBA learnings to build a team of exceptional people who work together to lead the Cleaning and Restoration industry in expertise, best practices, growth and profitability and believe in a Job done right. PROFIT: Your Guide to Business Success is Canada's preeminent media brand dedicated to the management issues and opportunities facing small and mid-sized businesses. For 32 years, Canadian entrepreneurs across a vast array of economic sectors have remained loyal to PROFIT because it's a timely and reliable source of actionable information that helps them achieve business success and get the recognition they deserve for generating positive economic and social change. Visit PROFIT online at PROFITguide.com.